The first commercial rocket launch in Scotland has taken place as part of the efforts to gain work at a planned spaceport in the Highlands, according to a new report at the STV TV news infosite. 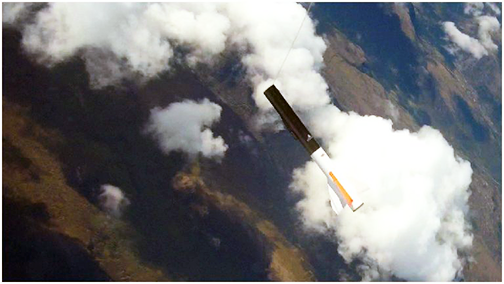 The Skylark Nano rocket in flight. Image is courtesy of Skyora. Skyrora saw its 2.5 meter (9 ft.) projectile reach altitudes of almost four miles after taking off at the Kildermorie Estate in Ross-shire. Known as Skylark Nano, the rocket accelerated to Mach 1.45. The Edinburgh-based rocket developer was trialing technology for use on full-scale vehicles, as it bids for a contract for the forthcoming facility. The commercial element of the flight was done in partnership with social media site Ask.fm. Cargo was ejected at burnout — staying attached to the body via a Kevlar cable — and a parachute was opened at low altitude for a soft landing. The planned £17.2 million spaceport will be developed by Highlands and Islands Enterprise. Last month, the UK Space Agency announced they would provide £31.5 million of funding for the overall project. If approved, it could see a vertical launch site built for a new generation of small rockets to launch micro communication and earth-observation satellites.